Sizzling Southern-rock essentials! 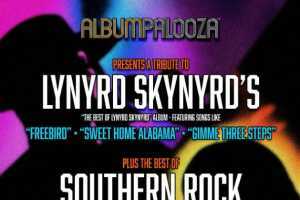 Classic-rock radio could not live long without these: Free Bird; Sweet Home Alabama; Saturday Night Special; Double Trouble; What's Your Name; You Got That Right; Gimme Three Steps; I Ain't the One; Swamp Music , and of course...."Free Bird"! The show is part of the "Albumpalooza" concert series which features world class musicians who recreate the magic of the albums we love performing them note for note, track to track and cover to cover in spectacular multi-media live concert productions.